We are immensely grateful to all who have supported us. We watched with horror last year as the Ebola epidemic took a grip of Sierra Leone and by the autumn of 2014 we realised it was all around us. We didn’t know it at the time, but we were about to have one in four of the children orphaned by Ebola in Sierra Leone under our care. The staff in Sierra Leone have been amazing. They literally put their own lives on the line and they never faltered. We had to seek out every orphaned child and make sure they were OK and it was a highly risky process, a process that cost our staff member Augustin Baker and his wife their lives. In this past year we have taken in as many children as we have done in the whole of our eleven years put together! Five hundred children were given sanctuary at St George Foundation and another three hundred were found foster care out of the two and half thousand children orphaned in our local area. These orphaned children have now moved on and, in most cases, are back with their natural families. We did the job we needed to do and kept up with the caseload and we are hugely proud and thankful for the staff in Sierra Leone who worked tirelessly under extremely stressful conditions. Their efforts have now been formally recognised by the President who called Justina, our local manager and co-founder, to the palace last week to receive a medal. 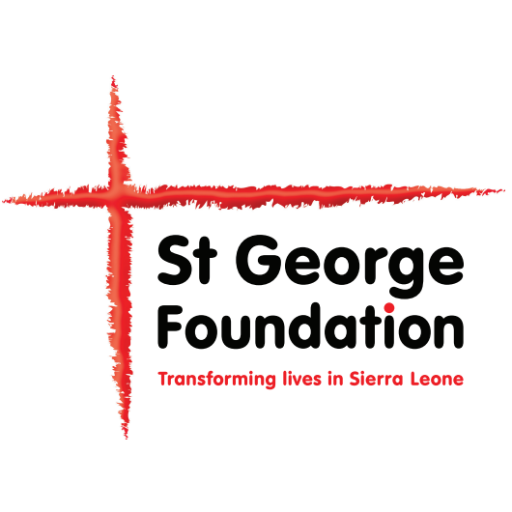 St George Foundation was formally recognised and thanked by the president himself who awarded them the medal and commended St George Foundation for exceptional services rendered in the fight against Ebola. We have to stress that without the incredible generosity of all our supporters we could never have managed more than a fraction of what we did."